Total employer compensation costs for private industry workers averaged $28.78 per hour worked in March 2012. Wages and salaries averaged $20.25 per hour worked and accounted for 70.4 percent of these costs, while benefits averaged $8.53 and accounted for the remaining 29.6 percent. The average cost for legally required benefits was $2.36 per hour worked in private industry (8.2 percent of total compensation) in March 2012. Social Security comprised the largest legally required benefit cost component at $1.36 per hour or 4.7 percent of total compensation. Medicare costs averaged 33 cents per hour worked or 1.2 percent of total compensation. Costs for legally required benefits such as Social Security and Medicare are often directly linked to wages; therefore, higher paid occupations or industries will typically show higher cost estimates for this compensation component. Costs for other legally required benefits include workers' compensation, which averaged 41 cents per hour worked (1.4 percent of total compensation); state unemployment insurance, which averaged 22 cents per hour worked (0.8 percent); and federal unemployment insurance, which averaged just 3 cents per hour worked (0.1 percent). 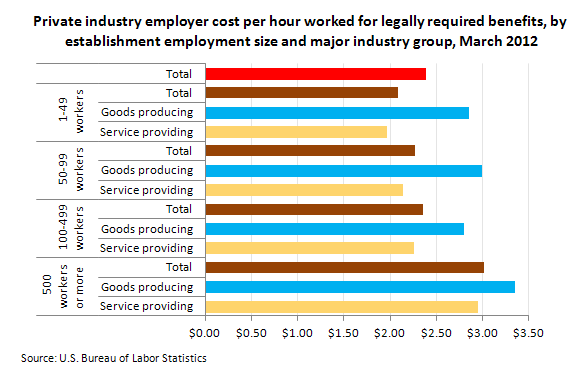 Employer costs for legally required benefits varied by establishment size and industry. Legally required benefits costs for private industry establishments with fewer than 50 workers were $2.08 per hour worked in March 2012, compared with $2.27 for establishments with 50 to 99 employees, $2.36 for establishments with 100 to 499 employees, and $3.02 for establishments with 500 employees or more. These data are from the Employment Cost Trends program. To learn more, see "Employer Costs for Employee Compensation — March 2012" (HTML) (PDF), news release USDL-12-1124. Bureau of Labor Statistics, U.S. Department of Labor, The Economics Daily, Employer costs for legally required benefits in March 2012 on the Internet at https://www.bls.gov/opub/ted/2012/ted_20120608.htm (visited April 23, 2019).